I create my books out of love and the conviction that they are sorely needed, and I’ve seen them succeed. I’ve measured their success in the proud smiles of many Latino children as they join hands with their schoolmates and myself, in the game song of Arroz con Leche. Or as we all sing vejigante chants behind paper masks when recreating a carnaval. 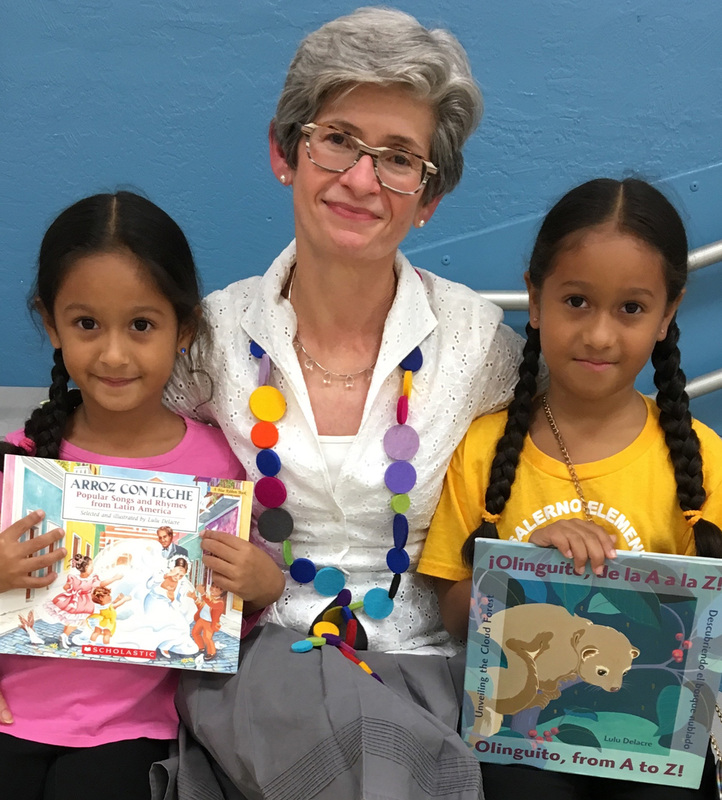 For when these Latino children feel their classmate’s enjoyment of their own language and heritage, they know acceptance. They may even glimpse the value of retaining their parent’s traditions and tongue as they embrace new ones. I was born in Río Piedras, Puerto Rico, the middle child in a family of three daughters. My parents are from Argentina. Growing up in the island was a fun filled experience, where climbing up a tamarindo tree with a friend to eat its fruit, was as commonplace as hunting for tiny brown lizards. I used to gently open their mouths and hang them from my earlobes as earrings! My earliest recollections of drawing--I must have been five then--go back to my grandmother’s house. My grandma, Elena, was from Uruguay. She baby-sat my sister and me, in the second floor apartment of and old pink house, while my parents taught at the University of Puerto Rico. She would give me white sheets of paper in which I would draw as I lay on the floor of her bedroom and listened to the classical records she played. I don’t remember her ever throwing away one of my pictures. She kept them neatly piled in a corner of her closet. year while my father was on sabbatical. There, one of my mother’s friends, a fine artist and teacher, encouraged me to join one of her painting classes. She was the first of several instructors who taught me to draw from real life and with whom I discovered the immense joy of being able to create. At the time I entered the Fine Arts department of the University of Puerto Rico I knew I wanted a career in art. Later on I was accepted into L’Ecole Supérieure d’Arts Graphiques, in Paris, France. By the time I did my thesis, an audio-visual project illustrating Saint Saëns’ Carnival of the Animals, I knew I wanted to become an illustrator of children’s books. I dreamed of creating books inspired by my heritage, books that celebrate the rich folklore and colorful traditions I was nurtured with as a child, books in English and in Spanish. Being an author/ illustrator is the most challenging and rewarding work I’ve ever done. I strive to achieve a high standard in both text and art, a draining task and times. So with each new book I eagerly await the moment when I can see the many parts come together in a cohesive whole. I delight in creating books that portray my own culture with authenticity in both words and pictures. And if painting Latinos true to their own beauty, fosters respect; or if sharing some of their stories builds bridges among children, I want to keep on doing it. Because for me, that is the true measure of success. ¡Viva nuestra herencia!